that sets your venue apart. Upgraded camera improves image quality and is easier to set up. that venues can incorporate into their promotional plans and activities. The music never stops. Jukebox music keeps playing while PhotoBooth is in use. Arrow Leisure have the very best Digital content available on Jukebox hire systems that produce excellent returns. The next generation entertainment platform, Playdium delivers a tailored music experience that reflects the unique musical taste of each venue. Music Profiles to Match Any VenuePlaydium is a breakthrough platform that allows venues to select from a variety of Music Profiles to tailor the experience to their unique vibe. 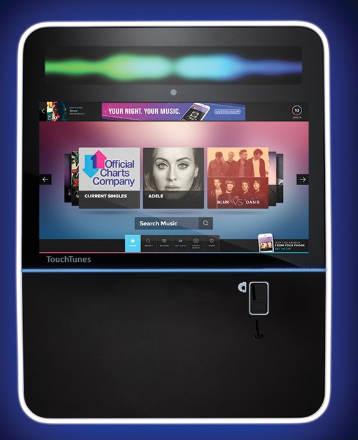 Promotes The Most Relevant MusicMusic is core to the TouchTunes experience and our latest smart jukebox learns from the music most played in a location and adapts over time to highlight the songs, artists and search results that are most relevant. playing the jukebox even easier. even on the way in. Earn bonus credits, other rewards and perks. See what song is playing on the jukebox and see what's coming next. Service Experts - Advanced Manufacturing and Diagnostics. Two-piece modular design and online diagnostics increase reliability and make servicing fast and simple. If there’s ever a problem, operators just swap in a replacement unit and send the original one back to TouchTunes for repair. As a venue operator we're sure you're aware of the importance music plays in creating the correct atmosphere in any pub, club or other entertainment area. This means that a state of the art digital jukebox hire system is an essential entertainment tool. No obligation free trials available.